Hillsboro freshman Grant Miller is shown getting ready to enter the arena for a hog show. During the 2018 Highland County Fair the Hillsboro FFA chapter had 12 members exhibit market hogs. The members purchased their hogs in May and have spent the entire summer feeding and working on raising their hogs to show at the fair. The members had the opportunity to show in showmanship on Saturday night and the market barrow show on Tuesday morning. After showing through the week the members sold their hogs on Wednesday night. The members who exhibited in the market barrow show include Zane Adams, Zinny Adams, Abby Brown, Lana Grover, Emma Hatfield, Joe Helterbrand, Lexey Hetzel, Grant Miller, Mallory Parsons, Riley Stratton, Jordan Williamson, Gracie Isaacs and Bryce Stanley. The members who placed first in their weight class were Zinny Adams, Hetzel and Miller. Zane Adams and Bryce Stanley both placed second in their weight classes. The members who placed third were Brown, Miller, Zinny Adams and Zane Adams. The members also had the opportunity to show in showmanship. The members who participated in the showmanship contest were Zane Adams, Zinny Adams, Brown, Grover, Miller, Parsons, Stratton, Williamson and Stanley. The members who placed second in showmanship were Zane Adams, Miller and Stanley. Submitted by Lexey Hetzel, Hillsboro FFA. 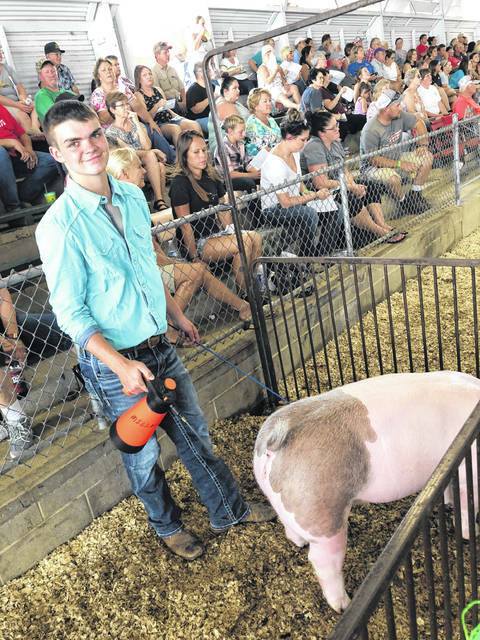 https://www.timesgazette.com/wp-content/uploads/sites/33/2018/09/web1_Hog-Show.jpgHillsboro freshman Grant Miller is shown getting ready to enter the arena for a hog show.